View of artwork location at El Monte Station transit bay concourse wall. Each panel measures approximately 8’ x 8’ (there are four identical bays with four identically sized panels). Metro is seeking four artists for El Monte Station. The two-level El Monte Station opened in 2012, and is located at the corner of Santa Anita Avenue and Ramona Boulevard in El Monte, 12 miles east of downtown Los Angeles. The station provides transit service on numerous lines for Metro, Foothill Transit, LAX FlyAway airport shuttle and Greyhound and serves over 18,000 customers a day. A bus rapid transit service, the Silver Line connects all Metro Rail lines. 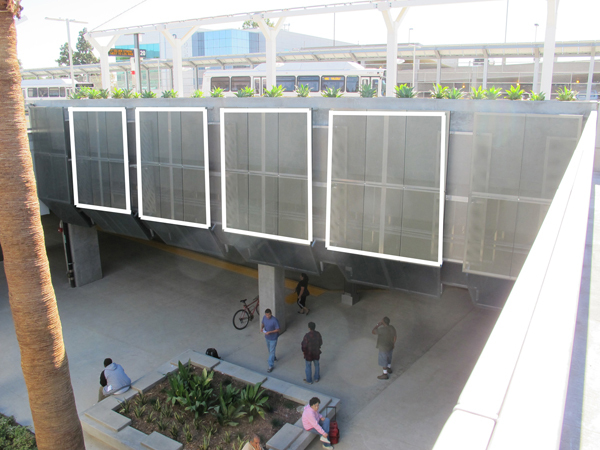 Artwork opportunities have been identified for the concourse level walls at each of the station’s four transit bays. For complete details and information regarding submittal requirements, download the Call to Artists and ARRA Requirements. Considering that El Monte Station has been opened for 6 months now, and that the lower level of it has all the ambiance of a PARKING GARAGE, NOW would be a time to add some “artwork”. If only this logic was used AFTER a transit/light-rail station’s construction was completed! P.S. There still remains an EMPTY BUILDING at El Monte Station that NOTHING has, or apparently WILL go into! Infrastructure is a long term investment. It takes time. Also, consider being part of the process during the planning phases to not only have your voice heard, but your ideas translated into the terra firma. LOL! And when might THAT be Matt? There certainly was no “invitation” for public input on the CONSTRUCTION of El Monte Station! And look how it turned out-an upper level that does NOT protect riders from the elements (e.g. sun and rain! ), and a lower level that has the ambiance of a PARKING GARAGE! So, when did the public get to submit its input again? The Metro San Gabriel Valley Service Council usually meets the second Monday of each month at 5 pm. Meetings are normally conducted at the Metro Division 9 building, adjacent to the El Monte Station, 3rd Floor Service Council room, 3449 Santa Anita Avenue in the City of El Monte. The public is invited to attend and encouraged to provide input to assist the Service Council to improve service in their area. I am well aware of the SGV “Service Council”, and a more USELESS BODY has never met! They do not respond to complaints on increasing bus service in the SGV, and they probably didn’t take into consideration ANYTHING regarding the construction, or operation of El Monte Station! Service Councils are a COMPLETE waste of time! I have been to their meetings. I have made complaints, suggestions, and other “public input”. Its a waste of breath, as much as their existence is a waste of space! I need work. I live in LA and I’ve been a artist over 20 years.